The house is beautiful but the views are even more stunning! Many times, we have talked about how beautiful a certain house is depending on its location and indeed, we have noticed how the location had impact to the overall look of a house. No matter where that place is and whatever you will see in the area, you can instantly tell the difference between one location to another but all of them have something in common and that is the area’s beauty. Today, we are going to show you a house that is located on an island on Greece. It shows a beautiful connection between the indoor and outdoor areas of the house. A house on a Greek Island is designed by Katerina Valsamaki showcasing a lovely indoor and outdoor living connection. 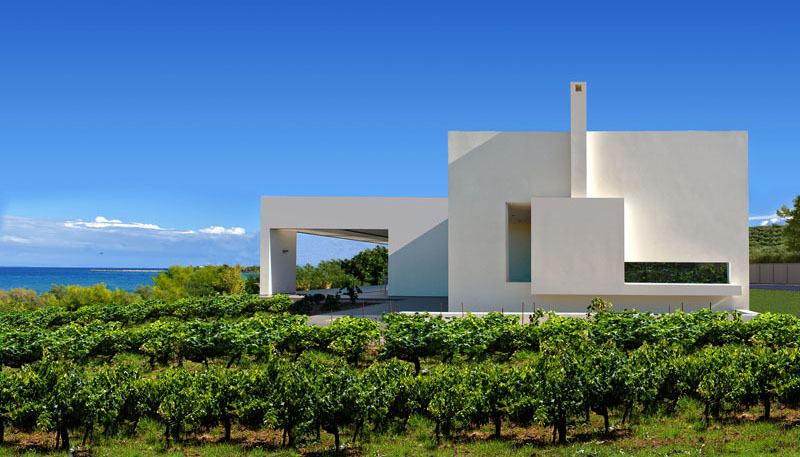 The house is located in the northeast corner of the island of Zakynthos in Greece and it has a design that is really stunning and attractive. It has various geometric lines and shapes in its exterior which indeed gives it a modern look. In the interior, it has modern minimalist furniture in it and many open areas to take advantage of the lovely surrounding. Let us take a look at the house in the images below. Unique feature: A beautiful modern home with many openings and a minimalist interior providing a good view of the ocean and the skies. 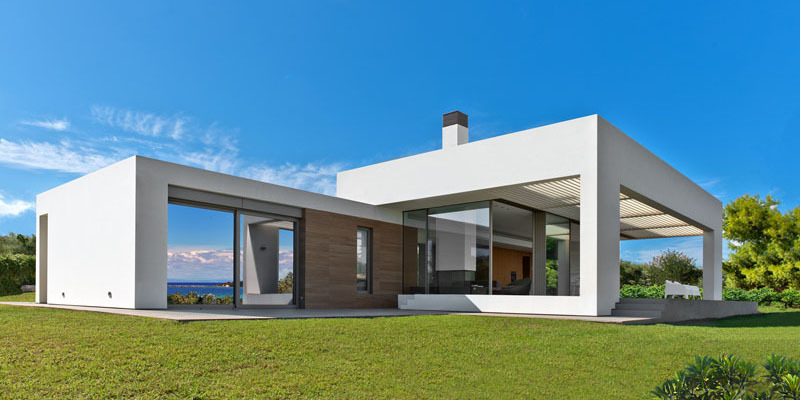 The house features sleek lines and make use of sliding glass doors to link the interior and the outdoor areas. You can see here the glass doors as well as the lovely view from the house. On this side, you can see that the house has geometric lines on it and has a combination of shapes that make it look really beautiful and unique at the same time. The house is specifically designed for a small family and their guests as a vacation house but it also has the potential of becoming a permanent residence in the future which is the reason why it is designed in a way that it could fit a permanent home. 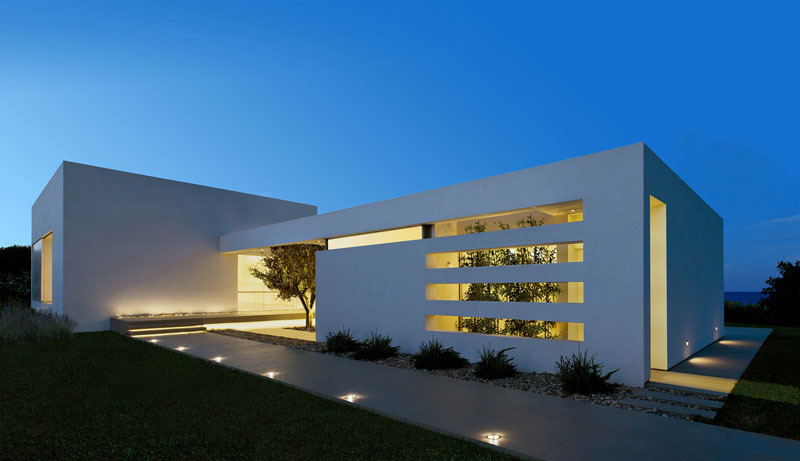 The house may be simple in white and has plants around it but its lights could add to its beauty like what we can see on this side. Notice that even on the walkway and steps there are lights. Another look at the small courtyard of this lovely home that welcomes you to the various areas through uniquely designed steps. You can see here a tree that seems to be the highlight of the area. This is a large patio area that extends to the living spaces. It sure is large enough for some gatherings ad serene enough to spend some alone time here while reading books and relaxing. 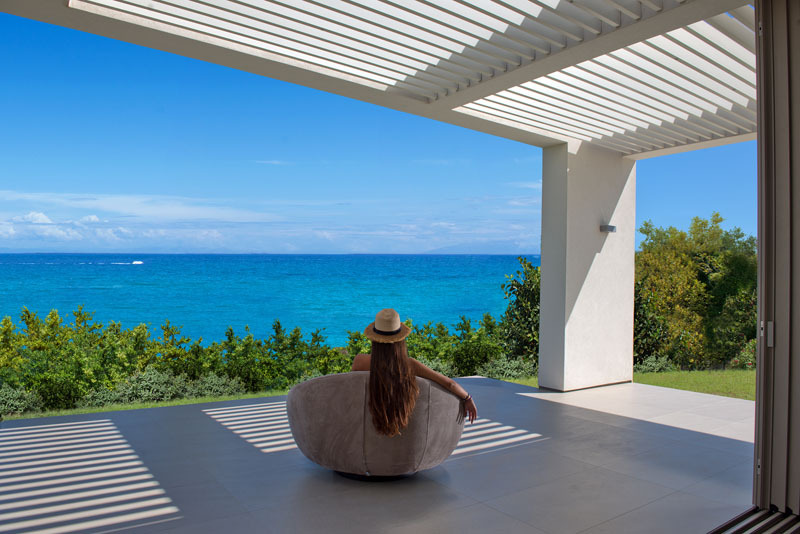 In this image, you can see that the home has unlimited view of the sea to the east, and it is surrounded by trees and vines, creating a private garden. The ocean looks really breathtaking from inside the house. Apart from the views, you can also see a comfy sofa, and its minimalist interior that includes a kitchen and dining area. Large sliding glass doors open up to connect the inside and outside spaces of the house together. This is the living area with white ceiling and some unique furniture design. The house has an open layout that connects the different areas of the house together. You can see that the wooden door of the kitchen cabinets can bring color to the interior that is mostly white. Because of its open layout, the kitchen and dining area share the same space at the living area. You can see that one side near the kitchen is another floor to ceiling glass wall that allows a view of the trees. This is the bedroom featuring glass windows that provide unobstructed views of the surrounding area. It has a minimalist design with a sliding glass door. The bathroom has been designed so that you can take advantage of the views, while lying in the bathtub since it is just beside the window. 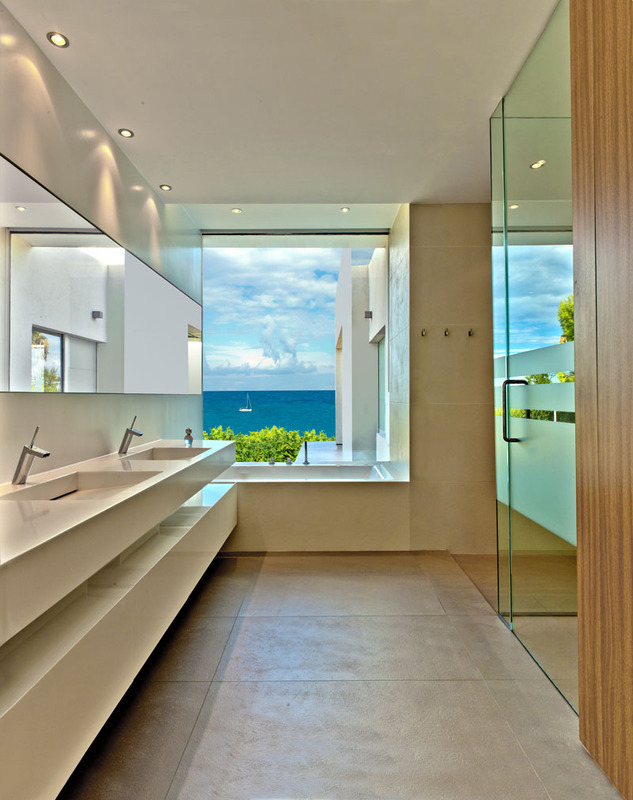 It features a long rectangular mirror and a long vanity with two faucets and sinks. On the other side of the bathroom is a door to the outside that can be accessed in this shower area. 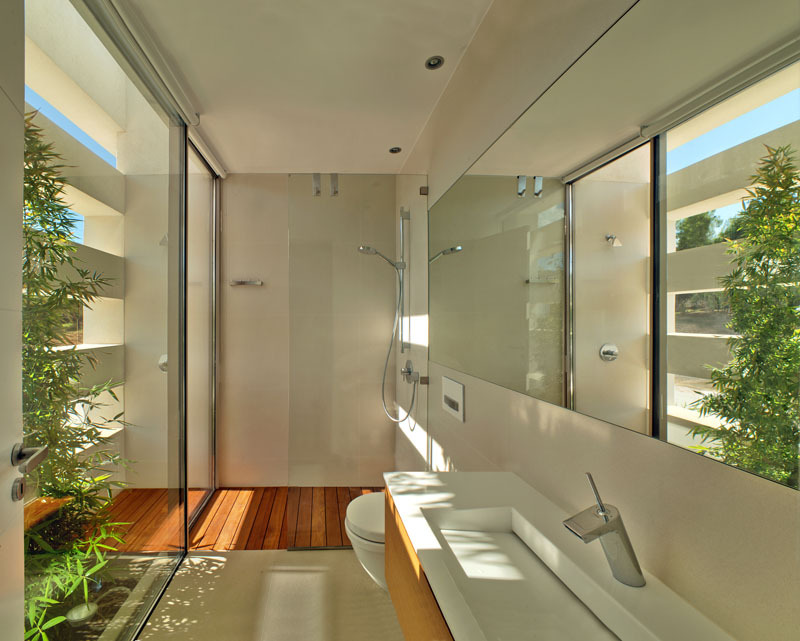 The shower area lets you feel like you’re showering outside because of the glass around it, the plants just outside the glass and the wooden flooring. This is indeed a lovely home! This house is designed by Katerina Valsamaki and obviously, the views of the skies and the waters. It actually feels rewarding to have a house like this that doesn’t only have a modern design but is also filled with furniture and decors with a modern style too, giving the home a totally stunning look that is cozy, functional and usable at the same time. All in all, this is indeed a lovely house!